I hope you all had a wonderful Thanksgiving! We had a great celebration and while we’re still in the throws of Thanksgiving leftovers, if you’re looking for something different this is a great flavorful but light soup. This also freezes great, so you can make a lot and save the rest for a rainy day. I made this for Tuesday’s School of Christian Living class and it was a big hit. This a great alternative to potato and leek soup full of delicious (vitamin C rich) broccoli. I had to do a lot of this in batches because I didn’t have a skillet large enough, but it worked out just fine to sauté part of the leeks and garlic and then transfer them to the soup pot while I sautéed the rest. 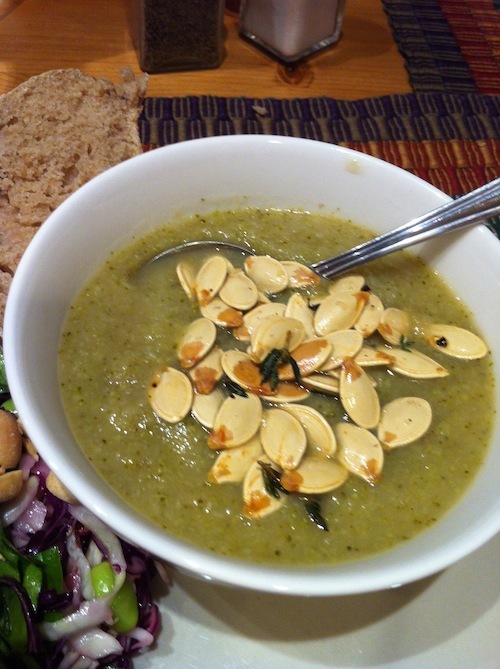 I topped the soup with toasted pumpkin seeds which added a nice chewy crunch to the creamy soup. I served this with a Cabbage and Lime Slaw, No-Knead Country Bread and a Pear and Cranberry Crumble (recipes coming soon). It was quite the delicious meal! In a large skillet, saute leeks until soft (I had to do this in batches), add the garlic and saute for another couple of minutes. In a large soup pot, bring the vegetable broth to a boil. Add in the sauteed leeks, garlic, thyme and potatoes. After a couple minutes add in the broccoli florets and simmer for about 10 minutes until the potatoes are fork tender and the broccoli is bright green. Use an immersion blender and blend until soup is smooth (or do this in batches in a blender). Taste and season with salt and pepper to taste.